In Democratic Republic of Congo’s mineral-rich Katanga province, poverty is widespread and child mortality is higher than in any country in the world. The recently refurbished Grand Karavia hotel in Lubumbashi, the mining capital of the Democratic Republic of Congo, offers everything international business people want. There are plush rooms, fine dining and a cigar bar overlooking the swimming pool. Yet in the copper, cobalt and uranium-rich Katanga province around the city, some 184 out of each 1,000 babies born can expect to die before they reach the age of five.That is more than in any country in the world. With a new generation of oil fields and mines coming on stream across Africa, many governments on the continent are determined to avoid this so-called natural resources curse. But African leaders with riches under their feet are facing a two-pronged challenge. First, they need to increase the share of wealth from underground resources that stays in their country, as they concede extraction to the multinationals that have the capital and technology. Secondly, they must find ways of spending that money wisely – to protect it from outright graft and to inject it into their economy in a sustainable way. “A number of African countries have run into new natural resources – Sierra Leone, Niger, Tanzania, quite a few of them – and are very eager to make sure that they do better than countries across the region have done in the past,” says Antoinette Sayeh, director of the International Monetary Fund’s (IMF) Africa department. One example is Guinea, where president Alpha Conde pushed through deep mining reform within one year of his election in 2010. The Guinean state will now receive a 15% free stake in all mining projects for the country’s flagship minerals – bauxite, iron, gold and diamonds. 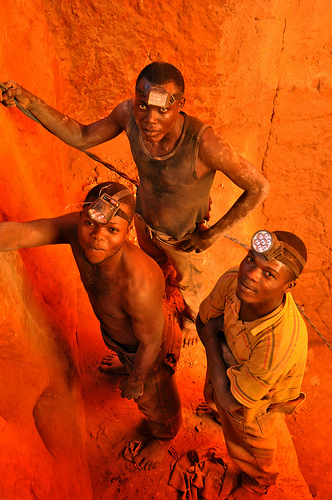 Guinea has made sure it gets a larger share of the profits made from mining its minerals. The secretary general of Guinea’s mining ministry, Guillaume Curtis, says the new legislation was a response to “mining contracts with abusive clauses that made it impossible to increase the state’s revenue”. Export taxes are now indexed on global metal prices and fiscal exemptions have been cut. “Yes, there are heavy investments, but the eight-to-12-year tax holidays given by our countries are exaggerated,” Mr Curtis says. The Guinean authorities are also negotiating with existing concession holders to improve the terms of contracts signed in the past. Just one year ago, the British-Australian miner Rio Tinto agreed to give the government $700m (£435m) and a 15% stake to keep its Simandou iron ore project. Democratic Republic of Congo has adopted a similar stance. The Democratic Republic of Congo government wants to increase its stake in mining projects. After a controversial review of existing mining contracts in the past five years, president Joseph Kabila has decided to rewrite mining legislation. According to mining minister Martin Kabwelulu, Democratic Republic of Congo’s $5bn (£3.1bn) annual copper exports yielded only 2% in taxes last year. “The problem here lies in deductible costs, for which there is no restrictive list in the mining code,” he says. Democratic Republic of Congo will, like Guinea, increase the government’s stake in mining projects, he says. Complaints about abusive oil and minerals contracts abounded at a recent conference on the management of African natural resources in Kinshasa. Getting a greater share of the earnings from copper and other minerals could help the Democratic Republic of Congo fight poverty. Disgruntled delegates from Mozambique and Cameroon said companies had conned their countries into accepting ridiculously low mining or transit fees. This could mean the end of unabated competition for investors, in which governments have been falling over each other to offer extractive multinationals the lowest possible tax pressure. Yet, assuming African countries do retain more revenues from their natural resources in the future and protect them from the greed of corrupt officials, they will face a new dilemma. “There are urgent spending needs in these countries on health, education, poverty reduction,” explains Tony Venables, professor of economics at Oxford University. “But it’s also important to remember that these are finite resources, this is possibly a one-off opportunity. Professor Venables and other analysts say that African leaders should be prepared to invest a significant proportion of the revenues from natural resources into productive infrastructure. To do so, they must face up to critics who may well say that “you cannot eat roads”, a complaint often voiced by opposition voters during the last Democratic Republic of Congo election campaign. Yet channelling massive revenues from natural resources into infrastructure development is no silver bullet. If sound procurement methods are not in place, if the local construction industry does not have the capacity to provide the railways and buildings the government wants, if there are no plans in place for the long-term maintenance of new infrastructure, the best intentions could send fragile economies into inflation spirals and damaging boom-and-bust cycles. Professor Venables thinks African countries that strike gold with natural resources should increase their spending on productive investments progressively , but he stops short of giving the antidote to the resource curse. “It’s very difficult and obviously completely country-specific,” he says.